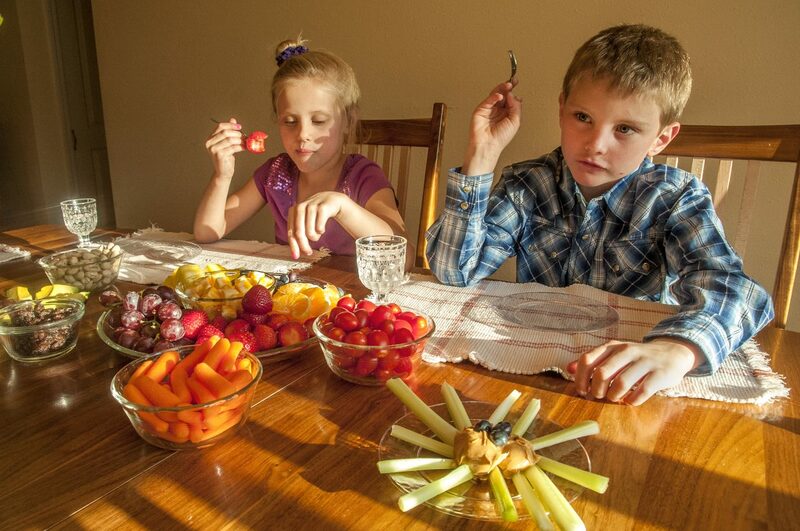 Sister and brother Jae Paisley Jenison, 5, and Jonah Jenison, 7, enjoy a feast of foods containing healthy sugars and fats prepared by their mother, Courtney Jenison. Fruits are a healthy alternative to processed sugars, and nuts, nut butters and avocados contain healthy fats that support optimal brain function. Jae Paisley begins kindergarten and Jonah begins the second-grade Monday. Craig — With the schedules that many families have these days, keeping kids fed can be a challenge. But keeping their brains fed properly? That can be an even bigger challenge. Most people have heard of a “heart-healthy” diet, but eating well for the brain hasn’t gotten as much attention until recently. It turns out that dietary priorities are changing among some researchers and doctors, with a bigger focus on eating foods that support brain health. For kids, healthier brains mean better, more accelerated learning. At a time when more and more students are challenged with learning difficulties such as attention deficit disorder, it’s important to make sure their brains are getting what they need. While the brain needs a lot of things to function at its best, including the right vitamins, minerals, antioxidants and good hydration, two of the most important aspects of a “brain-healthy” diet are low sugar and plenty of healthy fats. David Perlmutter, MD, board-certified neurologist and author of “The Better Brain Book,” “Raise a Smarter Child by Kindergarten” and “Grain Brain,” makes a strong case for reducing sugar and carbohydrate intake in order to boost brain function. In “Grain Brain,” published less than a year ago, Perlmutter refers to a recent study from the Australian National University in Canberra that linked high blood sugar with reduced brain function. The study, though performed on people ages 60 to 64, has implications for everybody. Children’s brains are still growing and developing, and a child’s main objective during the school year is to learn, which requires good brain function. A diet high in sugar not only inhibits the development of memory and cognitive skills but also can contribute to difficulty focusing. The hard part is that sugar is everywhere, and kids love it (and for that matter, so do grown-ups). The obvious first step is to limit the number of sweets kids eat and allow soda only on special occasions. Also, pay attention to the sugar content in processed foods and even in foods that seem healthy, like whole-grain breakfast cereals, energy bars, juice and flavored yogurt. Read labels and avoid foods with added corn syrup, high-fructose corn syrup, sucrose, dextrose and fructose. The good news is that there are alternatives. Fruit makes an ideal sweet treat, as its fiber content naturally slows the absorption of sugar into the bloodstream. Healthier sugars like honey, molasses and sucanat — pressed cane juice with the minerals left in — can be used in place of refined sugar. Stevia, a sweet green herb that often is ground up into a fine powder, can be used to sweeten things such as iced tea or plain yogurt while keeping sugar out of the equation altogether. For a long time, doctors and researchers have told their patients to steer clear of cholesterol and fat, but new research is beginning to show that both of these things are crucial for overall health and brain function. The brain is 60 percent fat and needs healthy fats in the diet to perform properly, like omega-3s and omega-6s. Olive, coconut and grapeseed oils are full of healthy nutrients and good fats, while even butter can be enjoyed more liberally than previously was taught. Foods such as salmon and fish, raw nuts and seeds also contain loads of good fat to nourish the body and the brain. The trans fats that should be avoided are found largely in processed foods and fast foods. Anything made with partially hydrogenated oils contains trans fats, which have been proven to be bad for the heart and the brain. “As you can see, a child eating mostly processed cakes and crackers, french fries and fried meats loaded with trans and saturated fats, will build a different brain than a child who is eating broiled fish, nut butter, salad dressings made with olive or safflower oil, eggs and lean meats,” Norman said on her website. One good rule of thumb? Stick to the perimeter of the grocery store when you shop, where you’ll find fruits, vegetables, meat, eggs and dairy products, and avoid the aisles in the middle of the store where the processed foods containing added sugars and trans fats live.